The David Douglas School District offers students a variety of learning opportunities that are aligned with the Oregon Department of Education’s content standards. In addition to being aligned with state standards, our curriculum is also aligned with the Common Core State Standards. Forward, our elementary integrated curriculum, blends reading, writing, and mathematics instruction with lessons in science and social studies in a way that spurs creativity. Forward emphasizes critical thinking, creative thinking, and academic success skills. Students will receive robust instruction across all subjects in the early grades. 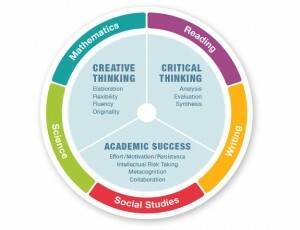 The curriculum is built around developing students’ critical and creative thinking skills as well as essential academic success skills, which lead to college and career readiness. Below are Forward Parent Guides for each individual grade level that will guide you through the curriculum.